iRescU Scouts - Enroll your school aged child to be an iRescU Scout cadet and receive a packet of information on how his/her class can help crowdsource the AED locations. T-shirt and key-chain included. iRescu Scout Leader: enroll your middle/high school aged child to be an iRescU Scout Leader. 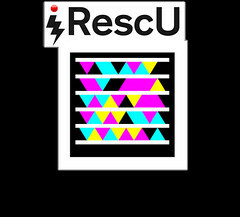 The program runs a iRescU AED Geolocation Scavenger Hunts in participation with the iRescU team including iRescU Scout patches for every 100 AEDs added by their troop. T-shirt and key-chain included. Challenge! Thank you all for your support! Do 1,000 people EVERY day, both children and adults need to die each year -and before they reach the hospital – from Sudden Cardiac Arrest (SCA) when we could actually save upto 80% of these tragedies?? We know what works, and the remedy is literally in the hands of the community! Major impact is now possible to address SCA burden of loss of life –with the creative use of social media and new technology tools, crowdsourcing and community engagement. SCA deaths in the USA are TEN times the road toll – 1,000 deaths each day children, men and women, adults young and older in the streets, homes, schools, playgrounds and workplaces of our nation. SCA Survival rates are a miserable average of 8% – worse in NYC, as low as 5%, one of the lowest cardiac arrest survival rates in the USA. In over 30 years there has been little change outside of a few specific sites . Many of these SCA events, ~ 60% are witnessed and victims can be rescued with immediate CPR and AED use. Upto 80% of victims have a defibrillatable rhythm in the first few minutes. But fewer than 25% of them get CPR, and in fewer than 2% is an AED used – and studies have shown that frequently there is an AED nearby that isn’t used. In New York City there are 4,300 AED locations in the government database, however the accuracy of these few entries, the validity and accessibility is not known. There are also estimated to be 35,000 AEDs in NYC. 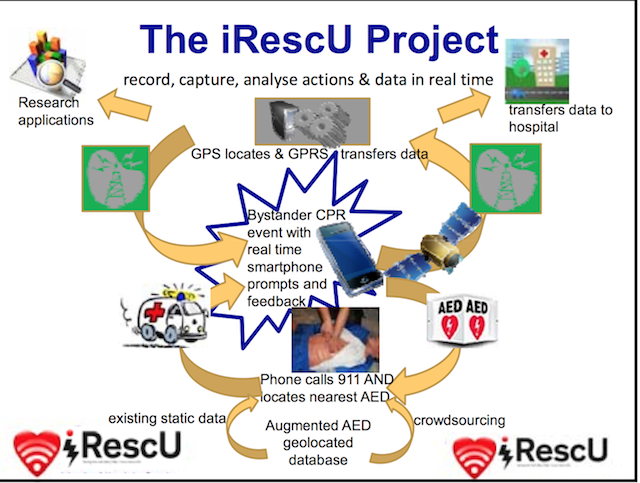 iRescU an innovative solution to address the problem of out of hospital Sudden Cardiac Arrest – to empower and engage the community to be involved – and in using a new tech, gamification and crowdsourcing approach to bridge the existing gaps in the chain of survival. 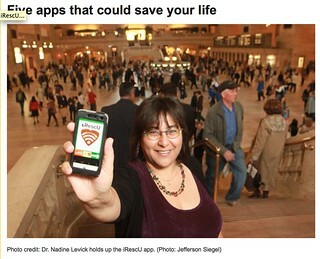 in most parts of the USA SCA survival rates are very low below 8%, as outlined above and in New York it is below 5%. Why? Often folks are not sure what to do, or even if they are, where to find the nearest AED. There have been some initiatives that have increased these survival rates in a few cities – which have been slow to replicate across the country and challenging to translate, sustain or scale. In this world of ‘there is an app for that’ there are now hundreds of apps for all sorts of Emergency situations and of varying quality. Most folks don’t know what SCA or CPR/AED use it. Even if they did, the location of the majority of AEDs in the USA is not known. This makes these point solution approach apps, whilst some very valuable reference material, limited in their effectiveness to address the burden of SCA, asides from the obvious of fumbling with a point solution app in an emergency. iRescU is not a point solution but rather integrated into existing infrastructure, linking both the community and emergency services. The key issues are empowering and engaging the community and also knowing where the nearest AED is and that it is in working order. The 911 systems need access to comprehensive and accurate AED geolocation data, as do bystanders at the scene of a cardiac arrest. Somewhat surprisingly there are no national comprehensive accurate and up to date federal databases of the geolocation of AEDs around the nation, nor does there appear to be a manageable sustainable initiative to generate one federally. All the tools to prevent upto 80% of SCA deaths currently exist – however how we get those in our society to identify and access those tools is the question. iRescU is not just another app – it is a systems engineered sustainable solution to bridge the existing gaps in effectively implementing the chain of survival and creatively engaging all levels of society in that solution. As outlined, studies have shown bystanders are often uncomfortable to perform CPR, locate or use an AED, and often ineffective in cardiac emergencies. Public AED location is complex, ad hoc and non uniform and there is no comprehensive national database of AEDs and in most settings the AEDs that are identified in a database, it is a static database and they are not locatable by the public in real time. iRescU is designed to address these key challenges and using new communication technologies to achieve this. By using a gamification approach and reaching out to engage all levels of the community across the life cycle to both increase awareness of the need for CPR/AED familiarity, with AED geolocation contests – reaching into a novel and new type of community audience, and also community and school projects. This geolocation data is captured into a cloud based data base via this gamification geolocation process combined with the integration of existing static databases – and each AED is validated locally for accessibility, availability and function before being confirmed as a validated AED findable via the iRescU system in an open source manner – walking running and driving distance from any geographical point. 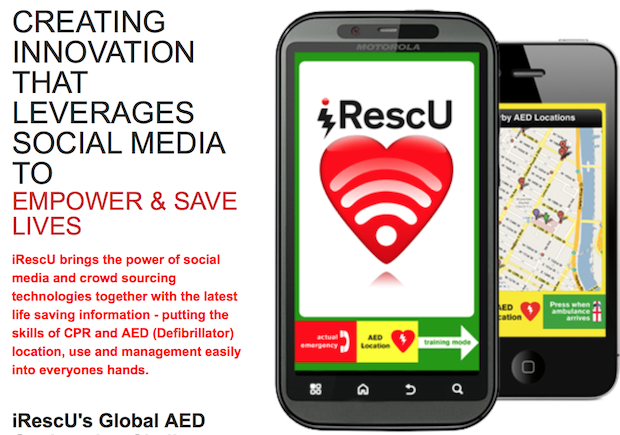 RescU Is a two-way system, with a backend on a closed loop CABIS cloud based data management platform and a CPR/AED frontend App for both adding AEDs found to the database, providing info on what AEDs and CPR are. It is ~1mb and developed for free access on all platforms. The CABIS platform is capable of multiple levels of administrative access privilege with scalable fields and capacity. The App’s framework is designed to be deployed in its advanced phase on multiple mobile platforms globally, functioning as both a data terminal and a data resource with the use of cloud-based cellular two way technology with capacity to manage CPR and AED data. The application provides for different usage modes. The App is designed is with simple clear high contrast screens, navigation buttons and clear text information (international local language capability), with user direction to infant, child or adult resuscitation guidance paths and adherence to AHA and/or ERC guidelines with no medical jargon. It has capacity to integrate the use of the accelerometer with visual, auditory, and haptic feedback to the CPR rescuer to assist their actual CPR performance, and links to an AED database to provide relevant real time information on AED location. It uses standard GPRS and GPS technology to both locate the emergency, and interact with local emergency services and resources, thus building a unique global data set of CPR/AED training and utilization. iRescU can also operate without connectivity, saving data until connectivity is made. iRescU is built on a closed loop 2-way system so that the information is always refreshed and constantly updated. 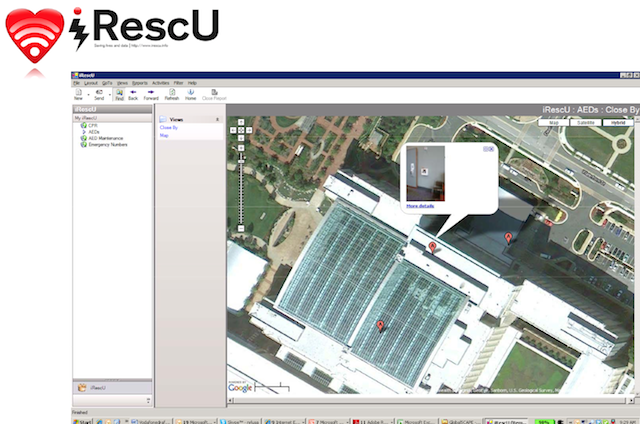 A core goal of iRescU is to build an open data accessible geolocated AED data base – bridging existing very limited government data bases with validated crowdsourced data, so that AEDs are accessible immediately where and when they are needed, along with other features such as CPR prompts and global emergency call numbers. 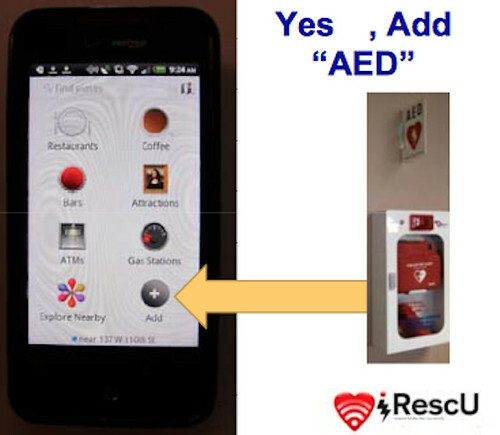 iRescU has been designed as a global solution, with the importance of AED location at its heart. AED geolocation data capture can be from multiple sources, and by design is gamified for crowdsourcing. Management of the AED data and locations is scalable, augments and enhances government data and can provide the right AED information at the right time, technically anywhere in the world. This is in contrast to currently largely limited government data which is primarily not open access or existing point-solution Apps which, although globally downloadable, have only isolated and limited local or regional AED location data. Current and accurate CPR/AED information in the hands of the community is vital. With a closed loop two-way system it is possible to rapidly update the front-end App directly, without the need for user input, and create a seamless and up to date interface directly accessible by the 911 system and automatically in the hands of the end user on whatever handset they are using. The iRescU solution is designed to enhance government data run on all major platforms: iOS, Android, Java and Windows Mobile and Phone. iRescU has a creative sustainable business model, with a 2-way closed loop CABIS data management system, integrated with social media platforms and a front end mobile device App with flexibility to easily update this data capture platform. Designed to be free on mobile devices well as to be integrated with existing social media APIs, such as geolocating platforms such as foursquare and pintarest! iRescU has conducted a number of pilot gamification challenges to test the utility of low cost use of social media to promote AED geolocation crowdsourcing. Also the iRescU Project has been presented at a number of scientific meetings. 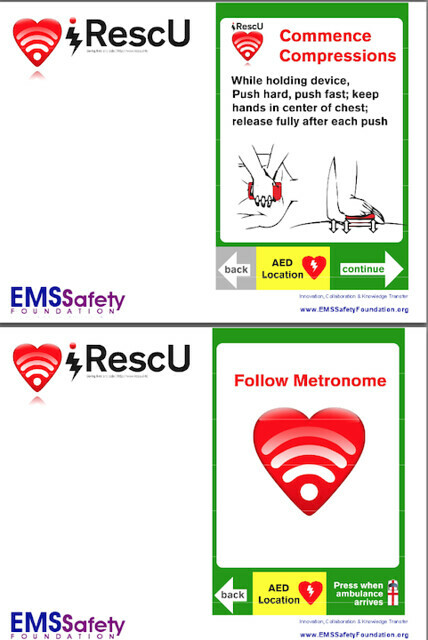 Currently iRescU has not made an application for FDA approval for the capturing of AED locations, and management of the AEDs, and application of AHA approved CPR/AED guidelines. Development of the use of an algorithm for rate and depth of compressions – is a projected development phase for the iRescU app aspect of this project. This project, by harnessing new technologies, and reaching out into the community with social media approaches and tools has potential to substantially impact the 30 year challenge and limitations in bridging the existing gaps in the effectiveness and utility of tools for rescuing SCA victims. By 2020 optimization globally of such approaches, which are much more cost efficient than the historical path – ensuring that all relevant new technologies are transferred in to addressing SCA, acknowledging this problem as a system engineering question – for which embracing and engaging the community is key – a faster ambulance is not the answer! Clearly with the advancement of tech hardware – some sort of electronic beacon will be mainstream for AEDs though likely by 2020, and AED will be the size of a match box and fit in ones pocket, however it is still paramount to engage and empower our society, and across the lifecycle. A 50 % improvement in survival of SCA should be an achievable goal. With many flow on advantages by way of the integrated community outreach. iRescU provides a tool and platform to bridge the existing challenges in SCA survival, specifically those of community engagement and the geolocation of AEDs, both major challenges to the effectiveness of use of existing SCA tools . iRescU also enhances public awareness of the issue of SCA, reaching out into new segments of the community and harnessing new technologies also, and highlighting the value in learning the skills that are key to saving a life. For most physicians, even those involved in cardiac care, and those serving cardiac patients – the challenges that this project addresses may not be immediately apparent. iRescU has already completed the preliminary stages of proof of concept, with both a number of crowd sourcing challenges conducted, and initial evaluation completed. We have presented our findings at a number of scientific conferences. Our project design has been from the outset to address sustainability, translatability and scalability. Our primary use of the contribution will be to conduct a series of pilot site roll outs, with New York City as the initial hub, and to evaluate the optimal and most effective path for dissemination and implementation of this type of technology and community integrated approach.